Want to lower your yearly vehicle expense budget? One sure way of cutting your automotive expenses is to buy used. Buying a car is without question one of the most significant transaction people make next to buying a house. Unlike buying a home, most vehicle purchases depreciate, making them a terrible investment. 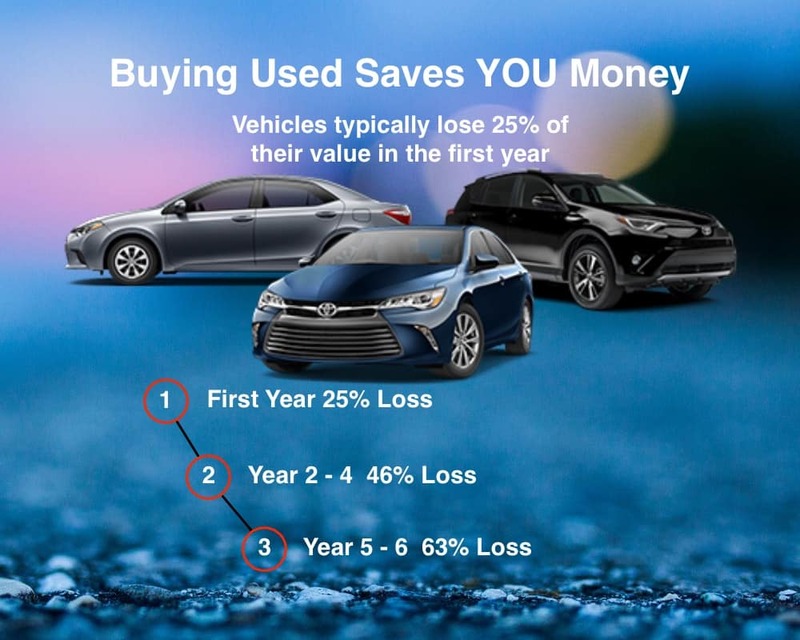 For those who are savvy buyers, learning when to buy and cutting your automotive expenses by buying used can save you a significant amount of money. The hardest hurdles for some buyers is foregoing the new-car smell and not buying into the latest models or trends. If you find yourself always wanting the latest car, truck or SUV, remember you will be paying much more than buying used. Edmunds vehicle data continues to show that a new vehicle’s first year is where depreciation hits the most. On average a new vehicle will lose around 25% of its value. For example, an average midsize sedan selling for $30,000 could lose as much as $7,500, making that $30,000 car now only worth $22,500. Tack on another three years and the vehicle loses on average an additional 21% of its value, but the drop isn’t as significant as the first year. After year 5 or 6 a vehicle depreciation again drops more due to maintenance costs, mileage and wear and tear. In general, a vehicle’s sweet spot is found in years 2 – 4 when depreciation isn’t as steep. For the frugal shopper buying a vehicle in its 2nd year and owning it for the next three years and then selling it will give you the best bang for your money. In our example above, buying the sedan for $22,500 (2nd year) and then selling it at the end of the 4th year will mean you will have roughly lost $6,300 over the three years you owned the vehicle due to depreciation. Had you bought the vehicle brand new, you would have lost an additional $7,500 or in this example taken more than twice the depreciation hit. Now, of course, the depreciation numbers don’t always match up, but it does give you a good idea of what may happen. Most reputable dealerships like the Fremont Motor Company have an inventory of Certified Pre-Owned (CPO) vehicles. The certification gives you extra protection should any issues happen while under the contract. Also, many “New Used” vehicles are still covered under the manufacturer’s warranty due to low mileage and still being within the warranty period. Certified Pre-Owned isn’t free, however, and additional costs are built into the vehicle price making the cars a bit more expensive over similar non-certified ones. That said CPO’s do help mitigate and minimize the risk of buying a used car and give you ease of mind.